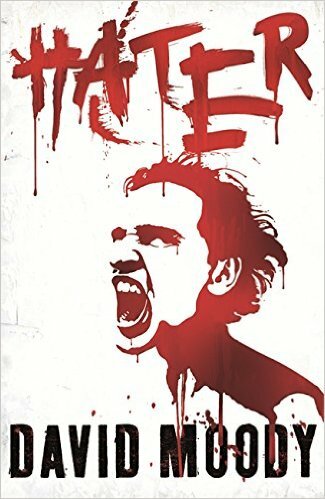 Hater was another of those books that I picked up because the premise intrigued me. I had previously read this one and I remember liking it, but I couldn't really remember the specifics of it terribly well. So I figured that if anything was worth a re-read, it was this. Hater is the story of what happens when a sudden and violent shift occurs in British society. Over the course of just over a week, there is a sudden increase in violent assaults across the country with no discernable reason. The reader follows council employee Danny McCoyne and his family as they try to cope with the increasing level of uncertainty and paranoia. There's a lot that I like about Hater. The build-up of tension is gradual and quite effective, going from a single incident to the point where armed police are a common sight. The violence is suitably shocking and brutal, counterpointing the comparative normality on show at the beginning. I just wish that I could have liked and sympathised with the narrator. I can appreciate where Moody was coming from when he created Danny: stuck in a dead-end job with the council that doesn't pay enough, stuck in a council flat with a nagging wife and three children under 10, trying to be civil to a father-in-law who seems determined to dislike you regardless of what he does. Honestly though, he comes across more whiny and self-absorbed than the intended sympathetic everyman. He coasts through his job because he doesn't have the drive to look for something better, then has the gumption to complain when his situation doesn't change. He has the money to go to a concert with his wife to get away from the kids, but when the question of a pub lunch comes up suddenly they don't have the funds. He claims to love his kids and tortures himself over the potential that someone in their family might turn violent, but it's difficult to believe when the only dialogue that he really has with his kids is either telling them to shut up or fielding their questions to unsubtly imply that they should shut up. There's just such an attitude there that is admittedly partially brought on by trying circumstances but mostly a result of his own laziness. I want to like him. I want to sympathise with his worries about looking after his family and his fears that one of them might be a Hater. But it falls flat for me, because there's so much about him that pisses me off.